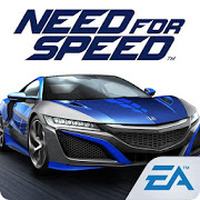 "Push the pedal to the floor in this extreme car race"
Game Goal: Feel the adrenaline of driving super cars and competing in illegal races through the streets. To make matters worse the police are also in tow, so make sure you accelerate at extreme speeds! How to Play: The main goal is to beat all rival racers of the city, however, for this you need to buy cars and adjust and customize them with parts and improvements. Game Options: There are several types of races through the city: Time Trial, Duel, Elimination, Multiplayer, among others. Graphics: The graphic quality of Need for Speed ​​No Limits is jaw dropping! The high level of detail, lighting and weather effects make for a super realistic and immersive game. Sound: The game comprises a collection of different music styles and benefits from great effects. Controls: The player can choose between two options to control the vehicle: Use the accelerometer or touch the device's screen. Languages: English, among many others. Content Classification: Great choice for racing games lovers, especially for those who are fans of the Need for Speed ​​series. Developer: ELECTRONIC ARTS is based in United States	- Reputable developer. Many cars and customization options. It has a great soundtrack. Many improvements can only be purchased with real money. There is a limit of "energy" that is consumed to compete in races. Do you like Need for Speed™ No Limits?